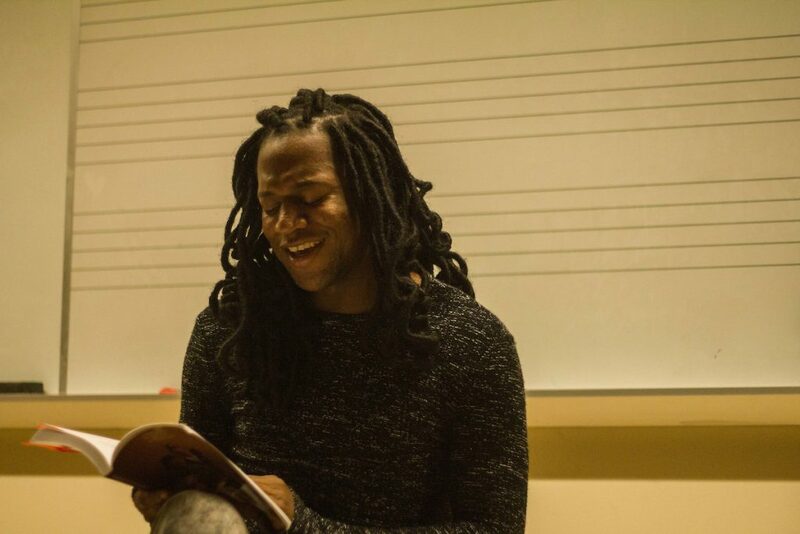 Tabias Wilson (LA ’13) returned to campus to speak about his book, “Godless Circumcisions: A Recollecting & Re-membering of Blackness, Queerness & Flows of Survivance,” where he was met with a full room inside the Granoff Music Center on the evening of Sept. 29. The event, titled, “BlaQ(ueer) Magic” was sponsored by the LGBT Center and the Africana Center. In an interview with the Daily, Wilson, now a third-year law student at Howard University, described Blaq(ueer) Magic as conveying the magic of being black. “Blaq(ueer) Magic speaks to the ability of black folks, despite all the things that white people [do], to always overcome,” Wilson said. Wilson has previously led similar events at colleges and bookstores across the United States. “Blackness is an ever-evolving creation of the cosmos … something that is visible but never spoken,” Wilson said. He cited the black prophetic tradition, which allows black people to express their experiences and beliefs about overcoming challenges they have faced, as why he first became involved in public speaking. “My grandmother was, in the beginning, very interested in kind of like black liberation movements, movements for black feminism, the freedom of black queer people, and so when we were growing up, she’d always have us reciting things like pieces from Maya Angelou and Malcolm X … and these great thinkers,” Wilson said. Tufts was the basis for much of the material Wilson covered in his book “Godless Circumcisions,” he said. Professors including Christina Sharpe and “the great Jean Wu” fueled Wilson’s inspiration when he wrote the book. Wilson said that during his time at Tufts, he contributed efforts toward starting the African American Studies program, now known as Africana Studies, and the Center for the Study of Race and Democracy. He held leadership positions in several student groups on campus including the Black Student Union, Queer Students of Color & Allies and the Theta Chi Fraternity. Wilson began the event by thanking everyone for coming, before opening the floor to people who wanted to read or speak for the first part of the program. “This is a community space, I don’t live in Boston anymore, this is y’all’s home, y’all live here,” Wilson said. He was followed by speakers including Jonathan J. Joseph, known as Mr. Johnny, a local poet who has lived just off campus for two years but has never before been on campus. “Oppressor, oppressed, means forgetting everything,” Mr. Johnny said. Mr. Johnny then continued with an encore about his grandmother. First-year Michelle Delk gave the final performance in this part of the program. She first discussed the flawed idea that everyone can achieve their goals through hard work, insisting that this only applies to white men born in the 1950s or from the Ronald Reagan-era. She also talked about the trouble her family has faced being what she calls “upper poor:” having too much money to be considered poor and not having enough money to be considered wealthy, yet not really falling in the middle either. “We are rich and love- and immorality-filled with hopes and dreams,” Delk said. Afterwards, Wilson played a Janet Jackson musical interlude before beginning the next portion of the program. During the interlude, LGBT Center Director Nino Testa thanked the Africana Center for co-sponsoring the event with the LGBT Center and briefly introduced Wilson, who continued to discuss his book in further detail throughout the event. “Some things just ain’t right in America,” Wilson said, before he began reading aloud passages from the book. In his address to the audience, Testa recalled meeting Wilson as a student at a Students Acting for Gender Equality meeting at the Women’s Center when Testa was working there. He commended Wilson’s evident problem-solving skills and ability to work with others. “It was a powerful example of when somebody is ready to work with others … how much they get done,” Testa said. Members of the Tufts community shared their excitement over Wilson returning to share his story. “We are always excited to see our alumni on campus, and see them doing well and share their experiences, and so we’re just really excited to co-sponsor this event,” Africana Center Director Katrina Moore said in an interview with the Daily.